It is a shame that things have turned out this way but unfortunately many people aren't aware of the background of people like Mr. Steyn and their supporters. They try to innocently claim they are stirring an open debate and free speech but the truth is they and their supporters happen to be of other faiths with some followers who see Islam not as a real threat, but a religious competitor that they must stamp out. It is ironic that they accuse Muslims of being against free speech but they denied the right to all the Muslim groups to present a counterargument to Mr. Steyn's hate propaganda against Islam. It should be very evident that he is interested in free speech only when it benefits his cause to stir up hate against Muslims but he and MacLean's would never dream of Muslims being able to defend themselves, as they realize it would likely educate the public to the stark contrast between real life Muslims and "Mr. Steyn's Muslims". You may notice statements made by people like Mr. Steyn and one of his most staunch supporters, Ezra Levant, continually make comments which are eerily similar to those accusations made on a website that openly admits is trying to "destroy Islam". Ezra Levant is the same columnist who distastefully republished the Muhammad cartoons in his defunct magazine to support the bigotry against Muslims and to supposedly defend free speech. What we find interesting is that when it comes to negative comments about Christians, not even hate-speech similar to what Muslims are subjected to, he is quoted as "I am not Christian, I am a Jew, but I believe I have a responsibility personally to fight anti-Christian bigotry." In our opinion this is near to an open admission that he supports the Christians and of course his own faith and wants to defend them, but hate-speech against Muslims is completely ok with him. Unfortunately we find similar traits and backgrounds with most supporters of hatred against Islam, such as the KKK being the one who is most happy with the Canadian Bill that would abolish the law which allows people subjected to excessive hate and propaganda to defend themselves and hold those accountable for breaking the law. This is not only about Muslims but all of Canadian society, especially minority groups of different ethnic and religious backgrounds who also face discrimination. We wholeheartedly agree with free-speech but one always has responsibility for the words they use, especially should they be untrue, and not only cause offence, but subject others to harm and unnecessary hate and harassment. A good example is that although we have freedom of speech, one can sue another person for defamatory and slanderous remarks made against them especially if they are untrue. What we're seeing is a double standard against Muslims, there are many things Muslims could be in serious trouble for saying, yet if a non-Muslim says something worse they not need fear investigation by law enforcement which is what the heart of this issue is. It is very unfortunate that people with a religious agenda are surreptisiously using the most common stereo-types against us in order to wage their war against Muslims and inciting the public with false accusations into fearing and hating Muslims. The situation for Muslims now is somewhat similar to Hitler's message of hate and propaganda that preceded the Holocaust. It is even worse that the media which has an obligation to tell the full story and truth, decides to promote people like Mr. Steyn. A good example is that the most major news outlets never publicized the comments from the Ontario Human Rights commission which made a few statements which were slightly damning to the position of Maclean's and Mr. Steyn. It also found the articles and writings of Mr. Steyn without question, to be inflammatory. The media is willfully and purposely picking and choosing what stories air about Muslims. Mr. Steyn is portrayed as someone who is for free speech and Muslims are being portrayed as being undemocratic and against free speech and that we simply won't tolerate any negative comments about Muslims which is completely untrue. It's as simple to understand that if someone starts spreading rumors about a close family member that destroys their reputation that you would likely resort to some sort of legal remedy to the issue, which is the same reason Muslims do not appreciate the hateful articles people like Mr. Steyn are using to falsely demonize Muslims in general as being a threat and against democracy and free speech. The CBC is the most respected and prided News Agency in all of Canada and we hold you and the journalists from CBC to a higher standard to tell the complete and full story and we only hope this will be covered properly from both sides. Muslims are not against free speech, we are a civilized democratic people who obey the laws of our country and simply want the same respect, treatment and protection any other citizen in this country is entitled to and not to be subjected to unfounded hate and attacks. A hearing into a human rights complaint alleging a Maclean's magazine article spread hatred against Muslims began in Vancouver on Monday. Mohamed Elmasry and Naiyer Habib of the Canadian Islamic Congress complained to the Canadian, Ontario and B.C. human rights authorities after the Toronto-based magazine published the article, titled The future belongs to Islam, in October of 2006. The article, an excerpt of a book authored by Mark Steyn, talks about Islam being a threat to North American institutions and values. It used statistics to show higher birth rates plus immigration mean Muslims will outnumber followers of other religions in Western Europe. Habib claimed the article violated the B.C. Human Rights Code by subjecting him to discrimination based on his religion and exposing him to hatred. "We know under the Supreme Court of Canada [and] under tribunals of this country that there are reasonable limits [to the freedom of expression]," Faisal Joseph, Habib's lawyer, said on Monday. "There is nothing wrong with Mr. Steyn expressing his view as long as he does not cross the line with respect to Section 7-1 of the British Columbia Act." Section 7-1 deals with discriminatory publication. It stipulates that a person must not publish or cause to be published anything that discriminates against a person or group, or exposes them to hatred or contempt. "We're prepared to deal with those articles piece by piece, paragraph by paragraph, and those things that we find objectionable," Joseph said. Lawyers for Maclean's plan to argue that publication of the article is part of free speech and open debate. "It does not meet the standard of hatred or contempt, and that's what we'll argue later in the week," said Julian Porter, one of the lawyers for Maclean's. 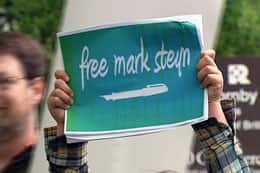 Several Steyn supporters waved signs and placards outside the building where the hearing was held in downtown Vancouver on Monday. They said the hearing shouldn't be happening at all. "We're of the view in the first place that the human rights tribunal doesn't have any business deciding what appropriate expression in Canada might be," said Jason Gratl, a lawyer for the Canadian Association of Journalists and the B.C. Civil Liberties Association. "Its activities and jurisdictions undermine the ability of journalists and members of the public to discuss important public issues such as race and religion," Gratl said. The fact that the hearing is even taking place is an attack on free speech, said Ezra Levant, publisher of the now defunct, Alberta-based Western Standard magazine. "I think this strikes at press freedom and even the freedom of thought of all Canadians. 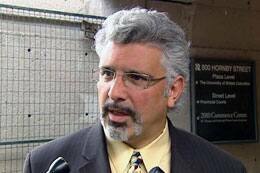 I think it's really an embarrassment that this is happening," Levant said.